Yogurt Parfait: Start the day with plain or vanilla yogurt, or cottage cheese, topped with raspberries and blueberries. Patriotic Cheeseburger: Cut cheese slices into star shapes and tint the pickles blue. Recipe. Potato Salad: Make red, white and blue potato salad with your favorite recipe. If you can’t find purple Perurvian potatoes (pretty close to blue! ), keep the skins on red-jacket potatoes. Sprinkle top with crumbled blue cheese or goat cheese, and decorate the bowl with a perimeter of blueberries or a dice of cooked Peruvian potatoes. Bean Dip: Make a white bean dip and garnish the perimeter of the bowl with chopped, seeded tomatoes. Serve with a mix of blue corn, red corn and white corn tortilla chips. Recipe. Red, white and blue cookie pizza. Photo courtesy California Strawberry Commission. Get the recipe. topped by a blueberry. For a sweet version, use graham crackers and cream cheese. Goat Cheese Stuffed Celery: Crunchy, creamy and accented with pomegranate arils and blueberries. Recipe. Tortilla Chips: Use blue and red tortilla chips with your regular nachos recipe, along with white Cheddar or other good white melting cheese. Sprinkle some blue cheese or goat cheese (it‘s very white) atop the red salsa. Angel Food Cake: White cake with red and blue berries. If you’re grilling, grill the cake first. Recipe. Parfait: Layer vanilla ice cream with strawberry or raspberry purée; top with whipped cream and blueberries. Patriotic Cookie Pizza: Sugar cookie dough (from the supermarket), whipped cream, vanilla yogurt, strawberries and blueberries. Recipe. 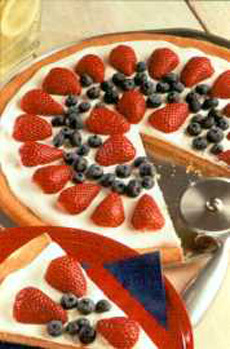 Similarly, you can top a white-iced cake or vanilla pudding pie or tartlets with red and blue berries. Patriotic Cupcakes: Red velvet cake, white frosting and blueberries. Recipe. If you have a favorite July 4th recipe, please share!